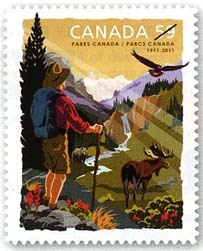 On May 19th, 2011, Canada Post began issuing a new stamp commemorating the 100th anniversary of Parks Canada, the first national parks service. Canada is a country covered with beautiful landscapes from one end to the other; it only makes sense that an organization be set up to protect these natural treasures and resources. The Parks Canada mandate is to continue to conserve these areas so that they can be visited for generations to come. Canada counts 47 national parks and 167 national historic sites.